As a website owner and blogger, my mission is to increase visitors as well as provide a good resource for other website owners and bloggers. When I first started blogging about 5 years ago, I was focused on increasing traffic by any means possible. Free link exchanges, banner exchanges, free advertising, directory submissions, etc. I didn’t really care how I got the traffic, just that I was getting it. The times of frivolous traffic gathering methods are over as if you go to the wrong place, you will see a never-ending supply of spam coming into your inbox. An onslaught of viagra and drug mentions will be pushing your regular emails out of the way and you will start losing your mind. Same thing with blog comments. Since those days, I have really taken time to make sure that I only submit my site to appropriate websites, use an email address that I don’t care if it is spammed, and don’t do link or banner exchanges anymore. I do all of this because I am tired of spam. Not just in email, but when they spam your site’s contact form or comments section. Spammers don’t care who you are or what type of site you have. If they can send you a message, then consider it done. As many of us have noticed, spam is getting out of control and fast. Every year we receive more and more spam messages and spam comments on our blogs. It is a never ending story that will continue on as long as blogs and websites are around. 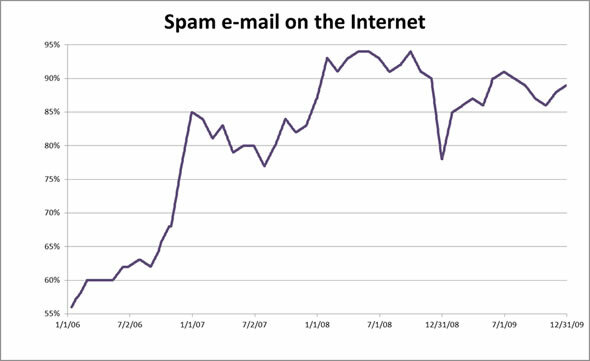 Unfortunately, there are still people that click on Spam messages, so that is why spammers continue to send them. One thing that every website owner and blogger should remember is that as your site grows in popularity and traffic, so do the attempts at spamming your site. Spammers want their links on your popular site, they want you to click on the emails. Always take the time to clear your spam queue on your blog, make sure that your blog comments are nofollow, and setup filters to get rid of spam before you even see it. Just know that spam comes with the territory of increased visitors and readership. There are great plugins to help you get around spam in WordPress, but they will continue to get through. Don’t get frustrated, just make sure that you delete them. You don’t want to damage your reputation by accidentally letting a spam comment on your blog. Not only does it look bad, but if one of your readers click on their link then they will most likely not come back to your site.